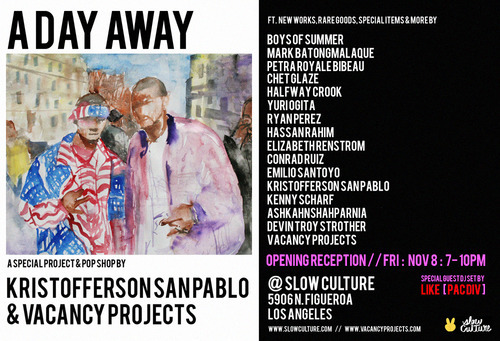 Slow Culture is proud to present A Day Away, the latest project from Los Angeles-based artist Kristofferson San Pablo & Vacancy Projects (a collaboration between Kristofferson San Pablo and Mary Vu, designed to explore the merger of art and commerce). 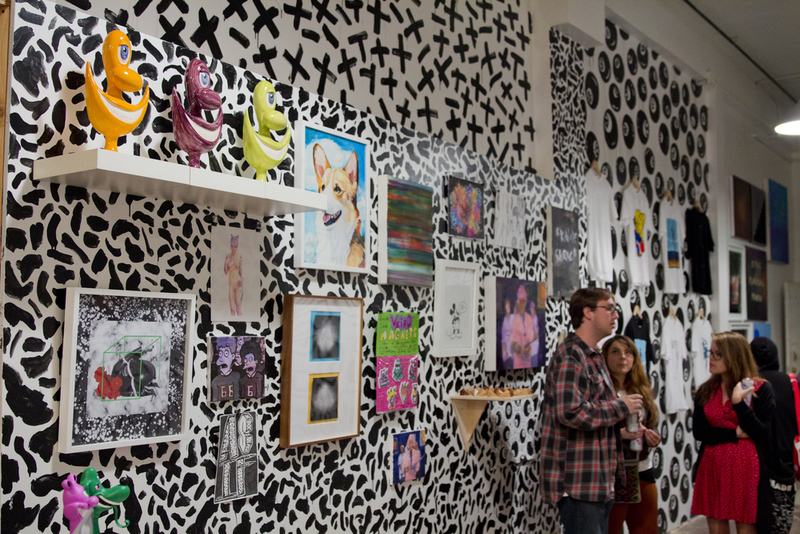 For this installation, San Pablo and Vacancy will create a fully interactive pop-up shop, featuring new works from San Pablo and Vu, as well as collaborative contributions from other artists in the community. This dynamic model of working is vital for San Pablo and Vacancy, as it is seen as a method to not only let artists work together in a way that may not have been possible outside the confines of the gallery, but also as a means to showcase and strengthen the artist community as a whole and facilitate the sharing of ideas. Referencing past, genre-bending artists such as Keith Haring and Sterling Ruby, art world renegades who successfully designed and applied their own aesthetic to commercial spaces, fashion boutiques, and public urban centers—blurring the line between private and public, between art and commodity—San Pablo has implemented his own distinct style to re-imagine the gallery space as an installation and retail platform which uniquely showcases the collaborative and multi-dimensional nature of Vacancy Projects. 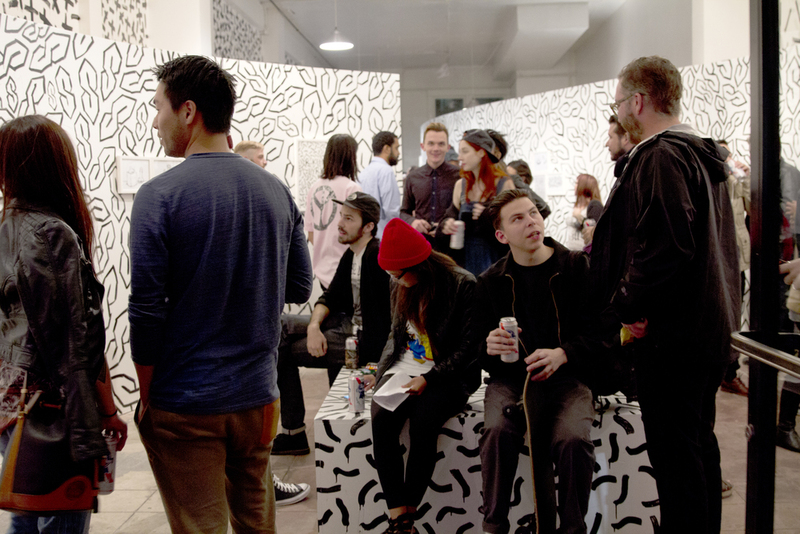 Heavily influenced by San Pablo’s roots in the Southern California art scene and his fascination with Art History, the space is designed to transgress the limitations of a typical art exhibition, to become an immersive lifestyle project. Echoing the energy of New York's Basquiat/ 'Downtown 81' glory days, fused with elements of1990’s Los Angeles, the outcome of this collaborative project is an experience that is uniquely 2013. The title A Day Away is derived from the distance it takes to reach the middle point between Los Angeles and New York, which can be found in Rock, Kansas, and is about 21 hours away—approximately a day’s distance. Participating artists include Mark Batongmalaque, Chet Glaze, Minami Haynes, Ryan Perez, Hassan Rahim, Elizabeth Renstrom, Conrad Ruiz, Emilio Santoyo, Kristofferson San Pablo, Kenny Scharf, Devin Troy Strother & more TBA.